You asked, and we listened. 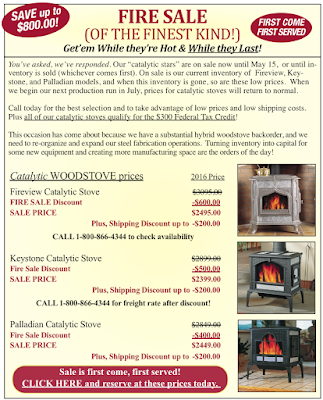 It’s been a while since we’ve featured our “catalytic stars” with a sale this big! This occasion has come about because we have a substantial hybrid woodstove backorder, and we need to reorganize and expand our steel fabrication operations. Turning finished inventory into funds, manufacturing space, and capital equipment is the order of the day! Inventory of these three soapstone models is very limited. Call today to inquire about available colors, 1-800-866-4344. Click here for Fire Sale Stove & Shipping Discounts! First: The distribution of oxygen to the hottest spot is better in a “top down” start-up. Complete combustion requires adequate oxygen, and when the fire is top down, adequate oxygen is always available. In a bottom up fire, there is likely to be less O2 at the hottest point, and there is a chance the fire can be suffocated as wood is loaded on the top of the fire. Second: Less heat is lost in a “top down” start-up. Clean combustion requires high heat. In a top down fire, as the bigger pieces at the bottom are heated up, the gasses they give off are consumed by the small hot fire at the top. This is good combustion design! In a bottom up fire, the gasses from the bottom pieces are cooled by coming in contact with the wood above them. 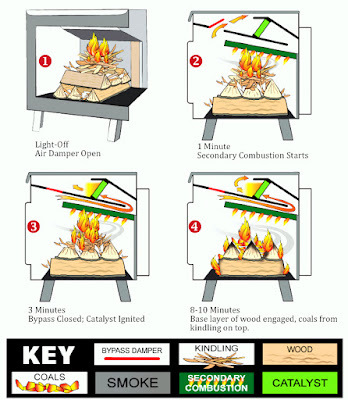 Third: No need to add wood or re-stoke the fire in a “top down” start-up. Not only does this mean no work for the operator, it also means that the wood at the bottom is heated more consistently, the air-to-fuel ratio is not subjected to sudden changes, and exhaust gasses are heated, rather than cooled. In a bottom up fire, when you add wood, the airflow is changed, the fire is cooled off (by opening the door and adding unheated wood), and more unburned gasses are created. Fourth: Having hot coals at the top in a “top down” start-up is a great thing! The radiant energy from those hot coals heats the wood beneath them. Gasses from the wood beneath them are burned as they pass through the hot coals. In a bottom up fire, the hot coals are at the bottom of the fuel load, so they can’t contribute to burning gasses from the wood above them. Why Woodstock Soapstone Stoves are totally clean burning almost immediately with “top down” start-up fires. Remember that when you build a “top down” start-up fire, you are maintaining the heat of the fire to the maximum extent. You are not quenching the fire by opening the door, adding wood, or limiting the supply of oxygen. There are two big reasons why we are able to clean up emissions almost immediately after light-off. 1. Our catalytic combustors are made of a very thin, high tech stainless steel material called Durafoil®. The Durafoil is just 50 microns thick; about the same thickness as a human hair. This ultra-thin material heats up very quickly, enables the catalyst to react with the exhaust gasses, and ignite very quickly. We have been able to get our catalysts to ignite easily in five minutes or less using a “top down” fire and dry kindling. 2. Our hybrid stoves supply secondary air through a flat, perforated, stainless steel fireback, and are able to achieve secondary combustion within minutes of lighting a “top down” start-up fire. A “top down” start-up fire creates the maximum amount of start-up heat. The kindling flames high in the firebox are more than adequate to initiate secondary combustion. To sum up our story, if you have a Spring Chill in your home, cool at night but warm enough during the day, try using the "top down" start-up method to start your fire. You should find your stove will heat up faster to ward off that chill, and your fire will burn longer and cleaner. And, you can astound your friends and family with your pyrotechnic expertise. We are now in the “shoulder season”, where we have warm days and cold nights. There’s no need to burn the stove all day – it is a waste of wood, and the house will be too warm during the day when the sun is out. The most efficient way to heat with wood, during this time of year, is to build a fire in the early evening and then let it go out. Here is a simple, efficient way to build a “top down” fire that will not need tending, and will keep the house warm from late afternoon through bed-time (and through the night, if you want, just add wood before bed). First: Check to make sure you have adequate chimney draft before building a fire. To check the draft, hold a lit match or lighter up towards the bypass opening of the stove, if the flame pulls up, you have adequate draft. If the flame is neutral or is pushed away from the exit, you will want to make sure you establish a draft before building a fire. To establish a draft, you will want to preheat the chimney with a lighted twist of newspaper held under the bypass door. Second: Put three short pieces (14’’-16”) front to back (North to South in stove-speak) behind the glass. Placement of these pieces allows the air from the airwash to go under the rest of the wood, all the way to the back of the stove. Insert some newspaper and small pieces of kindling in between these three pieces of wood. Tip: We save dry construction lumber for kindling (2x4s, or cut up old pallets). Small thin pieces from the woodpile get added to the kindling supply, because small pieces will dry out quickly. 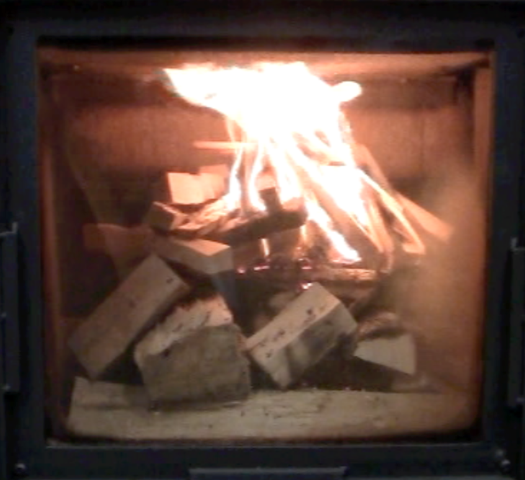 Third: Place three pieces of split wood across the bottom layer (East to West in stove-speak). Again, fill in the spaces with some loose newspaper and dry kindling. This second layer of split pieces makes a platform for the third and final layer. This platform should be 6”-8” above the floor of the stove. Fourth: Build a small kindling “tented bonfire” on top of the second layer. This “tented bonfire” should consist entirely of small pieces of split kindling – the drier (and smaller), the better. As you build this kindling bonfire, put some newspaper in the middle. Finally, open the damper all the way, light the fire, and watch! 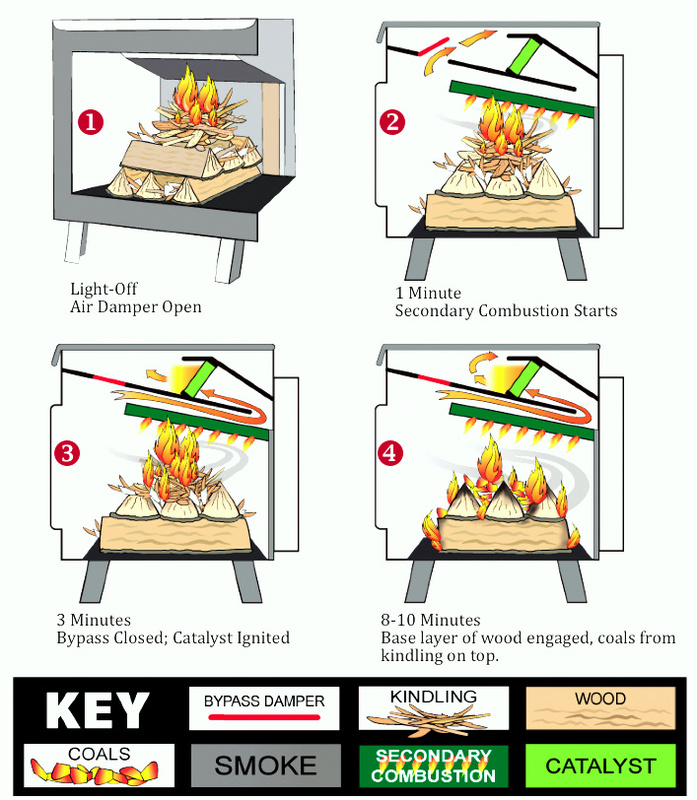 If you have one of our new hybrid woodstoves, and you are using dry kindling, you can close the bypass damper as soon as you see secondary activity on the fireback. This usually takes place in less than three minutes. If you are using one of our classic catalytic stoves and you are using dry kindling, we have found that you can close the bypass damper in as little as 5 minutes. As embers from the kindling bonfire fall into the split pieces, the fire will gain in strength and intensity, until it reaches the split pieces on the bottom. You will not have to open the door, or add wood. The six pieces of split wood (weighing 10-12 pounds) will burn for several hours; longer if you close the damper down a bit after an hour or so. You may have to experiment a little to get it just right. There will be very little smoke or emissions if you start a fire this way. You can see a video of us starting a fire this way in the lab here. Stay tuned, this post gives you the “how", our next blog post explains the “why” it works so well. April Steal of the Month: Tulip Mania! April has finally arrived and many parts of the country are enjoying Spring in all its glory. Tulips are among the first flowers out of the ground so it is not surprising that there are Tulip festivals this time of year from New York to Washington & Oregon, from Michigan & Iowa to Mississippi. We thought we would do a bit of our own celebration of this first hint of spring by featuring the Tulip our Ideal Steel Stove. During Tulip Mania, which peaked in 1637, only the wealthy could obtain tulip bulbs and the flowers. Now, in 2016, you can acquire your own tulips at a ‘steal’ when you take advantage of our Steal of the Month Sale and purchase an Ideal Steel Stove, complete with a bounty of tulips on the sides, top and even inside (andirons) your stove. 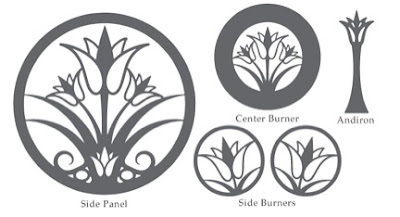 During the month of April, and only during the month of April, you can purchase an Ideal Steel Stove, complete with tulips, and all of the upgrades, for the low price of $2215.00, AND, you will also receive a FREE matching Tulip tool set. Join us here at the Woodstock Soapstone Company in our celebration of the Tulip. Take advantage of our April, Ideal Steel, Steal of the Month and enjoy the beauty of Spring all year with the special artwork shown below.